Beautiful smiles, lovely place to have breakfast. I have a confession to make. 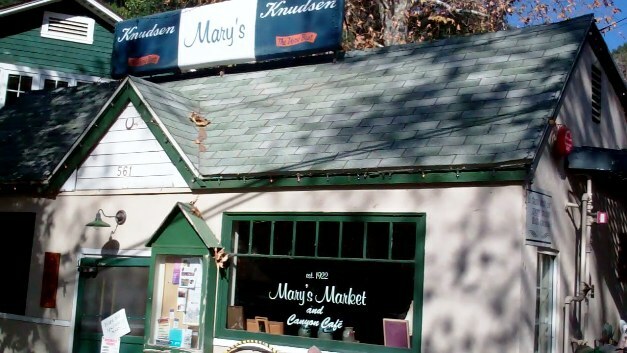 My favorite place to grab breakfast is a short freeway hop on the 210 to Mary’s Market and Canyon Café in Sierra Madre. 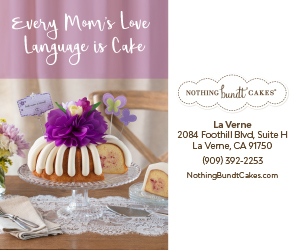 I used to go there regularly more than a decade ago when I was the managing editor of Sierra Madre-based American Bungalow magazine, but sadly, Mary and I parted company as my business interests took me farther east. Well, recently I was reintroduced to Mary’s, now under new ownership, but I’m happy to report that it is as charming and delightful as ever, a quaint eatery tucked into the canyon community that resides high above the downtown village. Although well off the beaten path, it should be no trouble to locate with your GPS unit guiding you to 561 Woodland Dr.
Last Sunday, when I should have been making atonement in church, I was at Mary’s enjoying my Gio Metro – scrambled eggs, turkey, tomato, onions, spinach, cheese and avocado served on a toasted bagel. The price was $6. Colleen had the McCann’s steel cut oatmeal served with brown sugar, fresh fruit (blueberries and strawberries) and milk for $4. You never get a bill. When it’s time to pay, you walk up to the register, and Carolyn, the owner, asks you what you ordered, and rings you up. By the way, when I told Carolyn I had strayed and not eaten there in quite some time, she gave Colleen and me each a warm chocolate chip cookie and a popover, all fresh out of the oven. Holy smokes! This place gets it. There it is under the sycamores. Now, I’m sure if Mary’s were located on Arrow Hwy, the café wouldn’t hold the same vibe, but then again, Carolyn and her crew are what make this place special. While I was happily munching away, three guys, one of whom looked like a member of ZZ Top, played a string of Cat Stevens and Beatles tunes, as beautiful as I’ve ever heard rendered on guitar and banjo. The good news is they’re regulars. I would pay a cover charge just to hear them. When I asked for their card after they finished a set, they told me to talk to Carolyn and she would be able to find them. Mary’s is also a market. When we returned on a Wednesday morning, while I was enjoying my Belgian waffle, Colleen browsed some antiques for sale. She bought a plain but ruggedly handsome cookie jar for $7. Mary’s is also open for lunch, which is just perfect. I’ve got it all planned out for my next visit. I’ll have breakfast, then go on a short hike up one of the nearby canyon trails and return for lunch under the shade of the sycamores. Best of all, Mary’s makes me feel as if I’m way up in California Gold Country, but the truth is I never had to leave the San Gabriel Valley. The reason I was hanging out in Sierra Madre so much last week is the town is where my Volvo mechanic lives. Nobody better. I’m not giving out his information. Some things are better kept to oneself. As for Carolyn, I asked her whether it was okay to share my breakfast secret with the world. She didn’t care one way or the other, but I’m sure some Sierra Madre residents, especially those who live in the canyon, won’t be very happy with my small article. I hope they don’t take the trouble to look up my picture. I might find myself standing in line for a table. 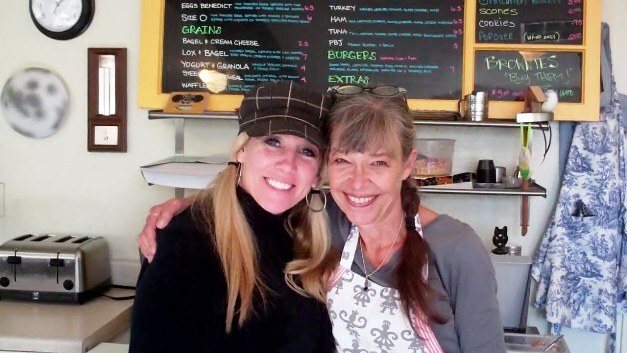 Mary’s Market & Canyon Café is located at 561 Woodland Dr., Sierra Madre, Calif. If you get lost, the number to call is (626) 355-4534. Whatever you do, don’t let anybody within earshot hear you say that Peter sent you. This is a really great little article about a small local business. I will definitely make my way towards visiting Mary’s Cafe. For me and my husband we love to support small local businesses; without people like Peter to let us know about these places some might just end up closing their business doors. As for myself I do enjoy giving my business to those few that are still in existence.